The war with the Eastern Empire ended in stalemate some eighty years ago, thanks to Nall’s ‘Engine’, a wizard-crafted weapon so powerful even the Deep Kings feared it. The strike of the Engine created the Misery – a wasteland full of ghosts and corrupted magic that now forms a No Man’s Land along the frontier. But when Galharrow investigates a frontier fortress, he discovers complacency bordering on treason: then the walls are stormed, and the Engine fails to launch. Galharrow only escapes because of the preternatural magical power of the noblewoman he was supposed to be protecting. Together, they race to the capital to unmask the traitors and restore the republic’s defences. Far across the Misery a vast army is on the move, as the Empire prepares to call the republic’s bluff. A highly accomplished example of world-building, in a rich literary environment, with a lot of thought-provoking potential. Ed McDonald’s effective prose, good pace and believable characters drew me right into his intriguing, very different, and fascinating world. A world peopled with horrifying but fascinating monsters and twisted landscapes. A gritty story full of gritty, desperate, humorous, nasty characters in a desperate, nasty world of varied land and city scapes, all drawn together into a well-rounded narrative. It has characters that feel familiar, but only because they are human with all the baggage that entails, and therefore likeable despite – or perhaps ‘because’ – of all their flaws. The feel of the story is that of a Wild West tale – a borderlands flavour that I love. Shocks and traps lie along the narrative route, episodes of rapid action, scenes of reflection, all are finely balanced to keep the reader on a blade’s edge of uncertainty. Decades before the story begins, The Nameless (almost immortal and powerful sorcerers) and the Deep Kings (godlike and demonic) warred over the world. The Nameless unleashed an unimaginably destructive weapon: Nall’s Engine, which destroyed cities, towns, villages, and millions of innocent people. It also created a huge expanse of land where the laws of nature were twisted beyond belief, a place known as The Misery – a poisonous wasteland full of dark magics, teeming with ghosts, and inhabited by strange and deadly creatures formed from the humans, animals, and plants that somehow survived the devastation, such as the creepy mind-controlling darlings, and the revolting yet seductive brides. Enough time spent under the bruised and ripped sky above The Misery can give a traveller a terrible case of the shakes. The ‘bomb’ succeeded in ending the war, but it is a fragile stalemate and the surviving peoples live under the threat of the Deep Kings returning one day should Nall’s Engine ever fail. The story is told in the first person through the main protagonist, Captain Galharrow, which brings the reader right into his world, his mind even, though I’ll leave others to discover if he’s a reliable narrator or not. Galharrow leads a team of mercenaries, bounty hunters of those that side with the Deep Kings, a job that introduces the reader to The Misery and some of its twisted denizens. He is also in service to one of The Nameless who communicates with Galharrow through a raven that rips its way out of a tattoo on the man’s arm. An alarming and gruesome form of messaging. The bird burns to ash as soon as the sorcerer’s orders are delivered and the tattoo is all healed soon after. Galharrow is a cynical veteran of war unafraid to do what’s necessary to survive, but also loyal to his closest friends and team members Tnota, the team’s navigator, and Nenn, a fierce fighter (both of whom are also strong, well-drawn characters). The memories that plague Galharrow allowed me to understand his personal history, and helped deepen and broaden the broken world he lives in. He is a conflicted character living on the edge of despair who medicates with alcohol. The magic-system of this world is interesting, new, something I’ve not come across before. Spinners and talents are people able to draw the energy from the light of the three moons. This energy is used to power the city, rather like electricity, it is also used for weapons, including Nall’s Engine. An old flame of Galharrow’s is a Spinner, but one with extraordinary power, who he must protect by his master’s orders. 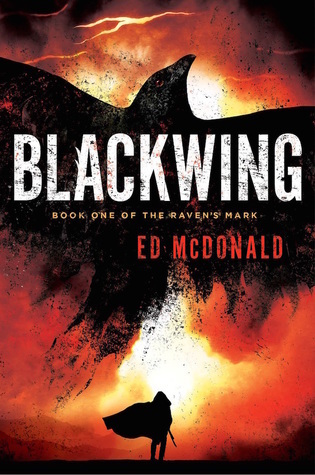 Blackwing was a thoroughly engrossing read, which I found hard to put down. I’m looking forward to book two and I recommend everyone who loves a bit of grit in their fantasy to get on and read this.